How can I say this nicely? Stop telling kids that sugar is toxic, and stop ruining their fun. Kids don't need scare tactics to make good choices, and they should be allowed to enjoy a holiday without their parents' food issues getting in the way. I will be handing out candy this Halloween, like I always do. There, I said it. Bad dietitian! Predictably because we're so close to Halloween, I'm seeing a lot of "candy is toxic" tweets and posts. I'm also seeing recipes for 'healthier Halloween treats' for kids involving non-food ingredients (or as I call them, just plain crap) like butter spray and some sort of food gum whose name has a lot of consonants in it. I think it's important as parents to take a step back and actually look at what we're afraid of in terms of foods we feed our kids and allow our kids to eat. Equally important is to review the messaging about food that we're sending to our kids, because if we're saying and showing the wrong things to our kids, it's going to affect the way they see food and eventually, their choices and feelings around foods for years to come. How can I say this nicely? Stop telling kids that sugar is toxic, and stop ruining their fun. Kids don't need scare tactics to make good choices, and they should be allowed to enjoy a holiday without their parents' food issues getting in the way. Sugar, while it is the 'villain du jour' and certainly not the healthiest ingredient in food, is not something that needs to be avoided altogether. If you feed your kids well most of the time -- say, 80 per cent -- then there is room in their diet for 'treats'. Not butter spray-weird food gum treats, either. If you're afraid of sugar, why are you not afraid of chemical non-foods? Priorities, people! While I am not promoting a diet full of sugar or chemicals, I really do think there is a time and a place for less healthy choices. I will be handing out candy this Halloween, like I always do. There, I said it. Bad dietitian! I'm a firm believer in not making food decisions for other peoples' kids, especially on a holiday. I'm not going to feel better about myself if I hand out non-food treats, and I know that most kids are knocking on my door for candy. I really don't think it's that big of a deal. 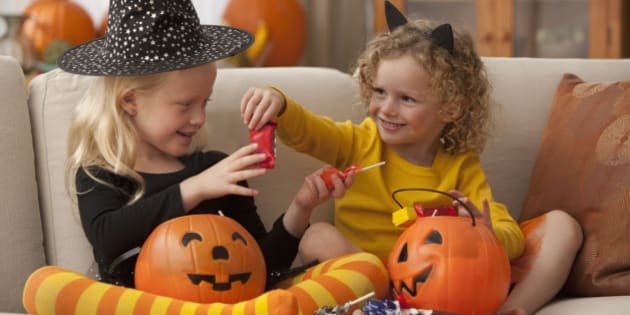 Halloween is one of the holidays that kids look forward to the most. Why ruin it for them by preaching to them about how sugar is evil, and not letting them collect and enjoy their candy stash? As parents, we are all responsible for teaching our kids how to make good food choices and providing them with healthy messaging about foods. Up to a point, we're also responsible for providing them with those foods -- so it's important to get this all straight before they are hit with major outside influences that will do this for you, in a bad way. If you scare or pressure your kids into making certain food choices, this can lead to guilty and shameful feelings about food when kids choose things to eat that they think are 'not good'. This tends to result in kids loading up on forbidden foods when they know that an adult isn't watching them and/or they're not even hungry. It's like a "get it while the getting's good" sort of mentality that seems to happen, and it's just as unhealthy as your "sugar is toxic" messaging. Modelling and teaching good food choices means being consistent and allowing kids to make their own choices, within reason. Provide structure and education around food, but give kids a chance to choose what they would like to eat, even candy. Let your child enjoy their candy in moderation, meaning let them choose one or two pieces to enjoy as a snack each day, and don't make a big deal about it. A few pieces of Halloween candy a day for the next few weeks isn't going to torpedo their weight, diet, or health, nor will it send them spiraling out of control into bad diet hell forever and ever. In fact, it will normalize candy as just another food, which is what you want. As I always tell parents, if you make a big deal about it, it's going to be a big deal. Just relax. Face the facts -- it will be impossible for you to keep your kids from eating candy for the rest of their lives. Why not teach them to be responsible with sweets and make healthy food choices most of time? Wouldn't that be a better use of your efforts? Halloween is not why there is a childhood obesity crisis in the world today, it's the fact that parents and kids don't know when to turn the treats off, and kids are basically having Halloween every single day of the year. They also aren't getting the essential nutrition education and guidance they need, at home and at school. Use Halloween as an opportunity to teach your kids about healthy eating and moderation. And a word about the 'healthier' Halloween treats that contain non-food chemical disgustingness: using these products with and for your kids doesn't teach them about eating healthy. It teaches them that chemicals are OK and that diet food is better than real, whole food. That's not a message you need to be sending to them, either. Choose real food, provide structure, and let the kids enjoy Halloween. For smart, reasonable information about feeding kids, look no further than my feeding guru, Ellyn Satter, here.